Chapter 6.1: Ribonuclease P: Structure and Catalysis: Figure 5 - Three-dimensional model of the bacterial RNase P holoenzyme–ptRNA complex (Tsai et al. 2003). Figure 5. Three-dimensional model of the bacterial RNase P holoenzyme–ptRNA complex (Tsai et al. 2003). E. coli RPP (C5 protein) was docked on its cognate RPR (M1 RNA) based on hydroxyl radical-mediated footprinting data. 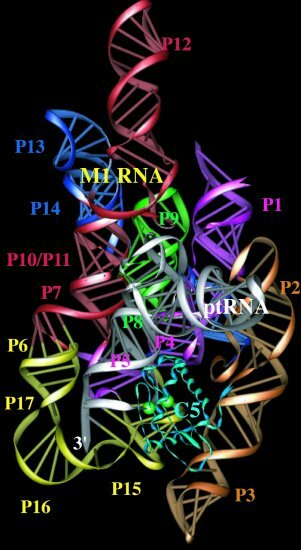 The base-pairing between the 3′-ACCA terminus of the ptRNA substrate with L15 of E. coli RPR and the proximity of the ptRNA leader sequence to the cleft in bacterial RPP were used to constrain the substrate on the holoenzyme structure. Color scheme: E. coli RPR in multi-color, E. coli RPP in cyan, and ptRNA in silver.